Watching my daughter labour in the crucible of fourth year design at OCAD University reminds me of my own time as a design student at NSCAD 35 years ago. Although much has changed since I graduated, some things have remained the same. One of those things is the contrast between the kinds of communication problems you are assigned in school and the kind you get on the job. In school, students are often assigned projects that have a social purpose. This links them to a part of the tradition that believes design can make the world a “better” place. It also reflects a social consciousness associated with the critical detachment enjoyed by academics, who are not dependent on paying clients for their bread and butter, but are compelled to adopt an analytical stance on professional and social issues. Most of that evaporates into thin air once a student graduates. The hard realities of branded commerce soon sink in. The designer must adapt to the cut and thrust of client demands, timelines, budgets and biases, and rarely if ever enjoys the “privilege” of exercising any personal concern for the broader social good. Equally rare are instances in which designers speak out publicly about these things. 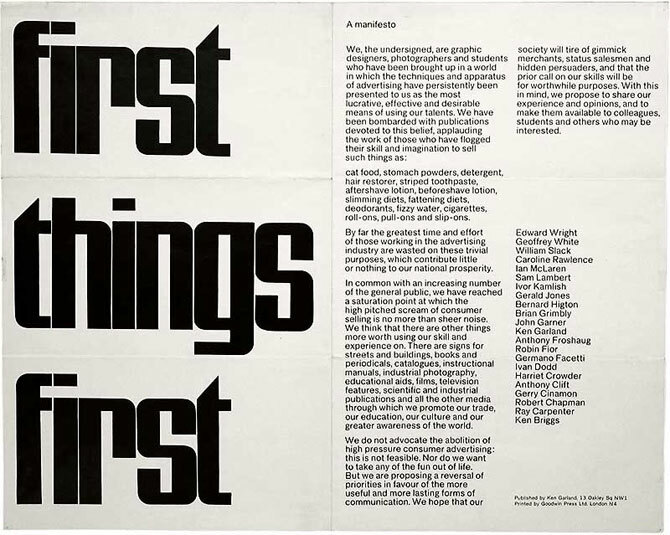 It happened once in 1963, when British designer Ken Garland published his “First Things First” manifesto in The Guardian newspaper, calling upon creatives to focus on more socially worthwhile activities than selling toothpaste, headache pills and candy bars. So I was both pleased and inspired when my daughter recently chose this manifesto as the subject of a short essay for one of her classes. Thirty-six years after Garland’s cri de coeur was written, writer Rick Poyno revisited it in an essay in Eye Magazine, wherein he lamented that the situation had grown exponentially worse. Another 15 years have gone by and things haven’t changed much. That’s a total of 50 years of stagnation. In our zeal to persuade consumers to buy our clients’ brands, we imbue them with ever more luxurious raiment and embellish them with compelling narratives. The emperor’s new clothes have never been flashier. Take a category like bottled water, for instance. In environmental terms, this is one of the most evil products ever devised. In a world where only 3 per cent of the water is fresh and only 1 per cent is drinkable, the stats on production, consumption and disposal are obscene. The plastic bottles take 1,000+ years to biodegrade; 80 per cent of them end up in landfill; 3 litres of water are used to produce 1 litre of bottled water; over 1.5 million barrels of oil are used to meet the demand for bottled water in the US alone. I could go on. In an age of relentless irony, some of the most egregious cultural contradictions can be found in branding. Take the bottled water brand Alaska, for instance. 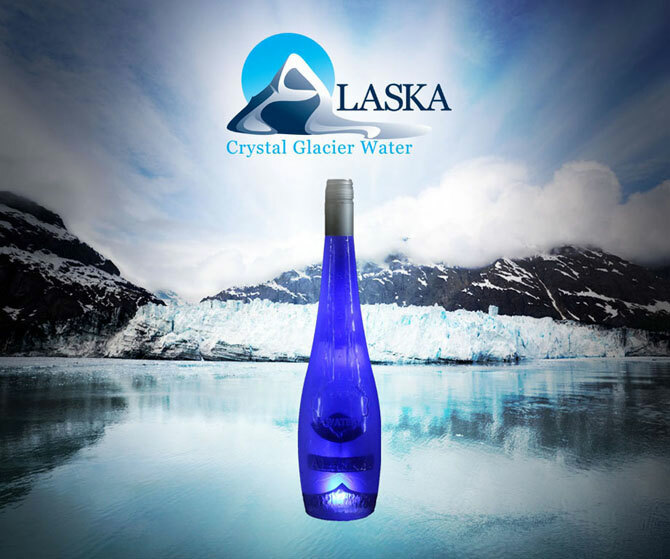 At a time when one of the most potent symbols of climate change is melting icecaps, Alaska water bills itself as “Crystal Glacier Water.” For an extra dollop of callousness, its logo is a melting glacier. I suppose it’s to be expected from a state governed by Sarah Palin, one of America’s most vocal climate change deniers. Despite the crimes we are committing with the world’s fresh water supply, there is hope. Some designers are doing more than just talking about this. OpenIDEO is a great example. It is an open idea management platform designed by IDEO to engage with anyone who has an idea for addressing a social or environmental problem. Human-centred, collaborative, empathetic, and not just for designers, OpenIDEO is a place where everyone can participate in applying design thinking to solve some of the world’s wickedest problems. Another is MIT’s Global Challenge, a platform originally designed by Idea Couture five years ago. I believe that everything we create to some extent changes the world we live in. Every chair, every website and every poster modify our reality — “We cannot not change the world.” Consequently, everything we do as designers has an impact on the world. In my designs I will strive to make my impact a sustainable one.